They’re nearby, they’re common and — at least in the latest exoplanet newsflashes hot off the cyber-press — they’re hot. We’re talking about red dwarf stars, those “salt of the galaxy” stars that litter the Milky Way. And while it’s true that there are more of “them” than there are of “us,” not a single one is bright enough to be seen with the naked eye from the skies of Earth. A reader recently brought up an engaging discussion of what red dwarfs might be within reach of a backyard telescope, and thus this handy compilation was born. Of course, red dwarfs are big news as possible hosts for life-bearing planets. 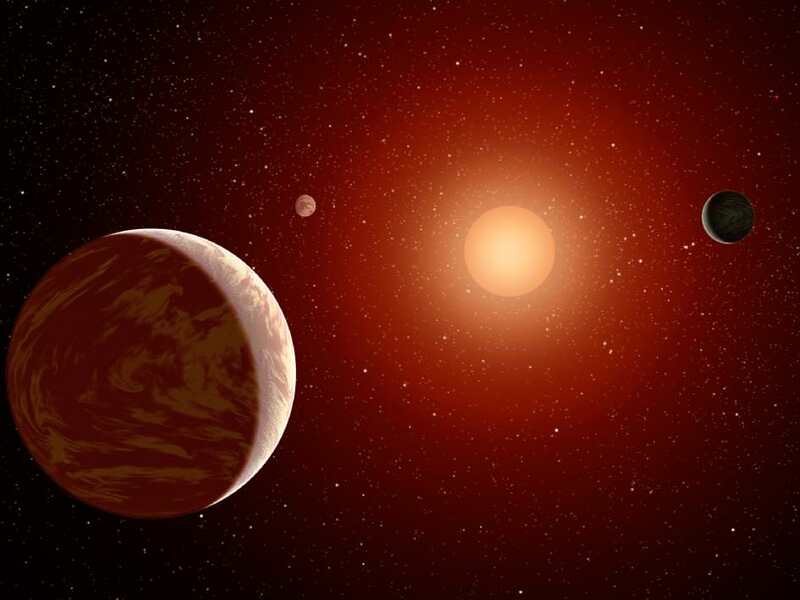 Though the habitable zones around these stars would be very close in, these miserly stars will shine for trillions of years, giving evolution plenty of opportunity to do its thing. These stars are, however, tempestuous in nature, throwing out potentially planet sterilizing flares. Red dwarf stars range from about 7.5% the mass of our Sun up to 50%. Our Sun is very nearly equivalent 1000 Jupiters in mass, thus the range of red dwarf stars runs right about from 75 to 500 Jupiter masses. For this list, we considered red dwarf stars brighter than +10th magnitude, with the single exception of 40 Eridani C as noted. The closest stars within 14 light years of our solar system. Credit: Wikimedia Commons, Public Domain graphic. I know what you’re thinking… what about the closest? At magnitude +11, Proxima Centauri in the Alpha Centauri triple star system 4.7 light years distant didn’t quite make the cut. Barnard’s Star (see below) is the closest in this regard. Interestingly, the brown dwarf pair Luhman 16 was discovered just last year at 6.6 light years distant. Also, do not confuse red dwarfs with massive carbon stars. In fact, red dwarfs actually appear to have more of an orange hue visually! Still, with the wealth of artist’s conceptions (see above) out there, we’re probably stuck with the idea of crimson looking red dwarf stars for some time to come. Groombridge 34: Located less than a degree from the +6th magnitude star 26 Andromedae in the general region of the famous galaxy M31, Groombridge 34 was discovered back in 1860 and has a large proper motion of 2.9″ arc seconds per year. Locating Groombridge 34. Created using Stellarium. 40 Eridani C: Our sole exception to the “10th magnitude or brighter” rule for this list, this multiple system is unique for containing a white dwarf, red dwarf and a main sequence K-type star all within range of a backyard telescope. In sci-fi mythos, 40 Eridani is also the host star for the planet Richese in Dune and the controversial location for Vulcan of Star Trek fame. Locating 40 Eridani. Created using Stellarium. AX Microscopii: Also known as Lacaille 8760, AX Microscopii is 12.9 light years distant and is the brightest red dwarf as seen from the Earth at just below naked eye visibility at magnitude +6.7. Barnard’s Star: the second closest star system to our solar system next to Alpha Centuari and the closest solitary red dwarf star at six light years distant, Barnard’s Star also exhibits the highest proper motion of any star at 10.3” arc seconds per year. The center of many controversial exoplanet claims in the 20th century, it’s kind of a cosmic irony that in this era of 1790 exoplanets and counting, planets have yet to be discovered around Barnard’s Star! Kapteyn’s Star: Discovered by Jacobus Kapteyn in 1898, this red dwarf orbits the galaxy in a retrograde motion and is the closest halo star to us at 12.76 light years distant. Lalande 21185: currently 8.3 light years away, Lalande 21185 will pass 4.65 light years from Earth and be visible to the naked eye in just under 20,000 years. Lacaille 9352: 10.7 light years distant, this was the first red dwarf star to have its angular diameter measured by the VLT interferometer in 2001. Struve 2398: A binary flare star system consisting of two +9th magnitude red dwarfs orbiting each other 56 astronomical units apart and 11.5 light years distant. Luyten’s Star: 12.36 light years distant, this star is only 1.2 light years from the bright star Procyon, which would appear brighter than Venus for any planet orbiting Luyten’s Star. Gliese 687: 15 light years distant, Gliese 687 is known to have a Neptune-mass planet in a 38 day orbit. Gliese 674: Located 15 light years distant, ESO’s HARPS spectrograph detected a companion 12 times the mass of Jupiter that is either a high mass exoplanet or a low mass brown dwarf. Gliese 412: 16 light years distant, this system also contains a +15th magnitude secondary companion 190 Astronomical Units from its primary. AD Leonis: A variable flare star in the constellation Leo about 16 light years distant. Gliese 832: Located 16 light years distant, this star is known to have a 0.6x Jupiter mass exoplanet in a 3,416 day orbit. The closest stars to our solar system over the next 80,000 years. Credit: FrancescoA under a Creative Commons Attribution Share-Alike 3.0 Unported license. One nitpick though for those who seldom get to use their department-scopes (like me): Would be nice to know when the best time is to view these red dwarfs (spring, summer, autumn or winter), and from which hemisphere! – Ursa Major is best in spring (however circumpolar, so can be viewed the entire year in the NH). But no luck in the SH? Roughly: High/positive values for declination (Dec) usually mean NH only, while low/negative values for Dec mean SH only. RA 00:00h is best in autumn in NH (September, October, November). And autumn in the SH (March, April, May)? RA 06:00h in winter NH (December, Januar, Feburary). And winter in SH (June, July, August)? RA 12:00h is spring in NH (March, April, May). And autumn in SH (September, October, November)? RA 18:00h is summer in NH (June, July, August). And summer in SH (December, Januar, Feburary)?